On May 26th, 2016, at the G7 summit in Japan, Obama spoke about the danger of nuclear war, which has become more of a reality today. On the same day, US media said that Donald Trump, the main troublemaker in the presidential race, gained the required number of delegates in order to become the official candidate of the Republican Party. At first glance, these events are not linked. However, recent actions and symbolic gestures of the US leadership demonstrate that the Obama administration has committed itself to exacerbate relations with geopolitical opponents, primarily with Russia, including the possibility of "hot war". The Donald Trump factor plays an important role in this policy. In the last few months, the United States has demonstrated increased attention to Northern and Eastern Europe. In this region, almost every month since 2014, joint exercises to repel a common "threat" are held. The “threat” means Russia. On May 25th neutral Sweden approved a law authorizing the deployment of NATO troops on its territory. The leadership of Finland is planning to hold a similar solution. On May 20th, Obama personally discussed an anti-Russian strategy with the heads of Norway, Sweden, Finland, Iceland, and Denmark. A few weeks ago in Eastern Europe, the United States opened a base in the Romanian city of Deveselu, where elements of the missile defense system are formally placed. It is planned to open a similar base in Poland. The launch trajectory that extends over the new US base in the Artic would not protect them from Russian nuclear missiles. The nuclear deal with Iran also makes this setting unnecessary. North Korea has nothing to do with it due to the issue of geography. However, the same installation can be used to host and launch Tomahawk cruise missiles with nuclear warheads to hit the territory of Russia. In July, the Warsaw NATO summit will be held, where an announcement will be made on an increase of the US military group in Eastern Europe. The US plans to expand its permanent military presence in Europe in the New Year and deploy two additional divisions on a permanent basis (Armor and Airborn). Also, the US military presence in Georgia will increase. Obviously, US military pressure on Russia in Eastern Europe is increasing, as well as the possibility of a direct confrontation. The US also tightened its position in Syria. Last week, Labib Al-Nahhas - leader of the terrorist group "Ahrar al-Sham", which was created by former members of Al-Qaeda - visited Washington. US also declared on May 25th that they are not interested in peace in Syria, but in the resignation of Bashar al-Assad. This means that they have entered the final course of the war against Russia and Iran in the region. In Ukraine, despite the concessions of Russia, the United States continues to accuse Russia of disrupting and not fulfilling the Minsk agreements. In fact, the Russian side reached the limit on compromise. Kiev, endorsed by the US, refuses to grant special status to the disputed territory of Donbass. Failure to make any compromises serves to aggravate the situation in the region. The United States requires Russia to admit its defeat and give Donbass to Ukraine, something Russia will not do - ever. The likelihood of a new outbreak of conflict thus increases. The situation in the South Caucasus is also unstable, where the United States is pushing Armenia and Azerbaijan into a new conflict. The Obama administration pressures European countries to ensure that sanctions against Russia are extended at the June EU summit. The US still tries to hit oil prices to put economic pressure on Russia. At the G7 summit, Obama plans to achieve a consolidated anti-Russian stance on sanctions and force Tokyo to rethink their attempts at rapprochement with Russia. At the same time, pro-Russian political activists in Eastern Europe were arrested. The most notorious event was the arrest of the leader of the Polish Party Zmiana Mateusz Piskorski with several activists on May 18th. It seems that the US is preparing a hot or hybrid war against Russia on the aforementioned fronts. At the same time, the possibility of a candidate coming to power who wants to fundamentally change American foreign policy only urges the current US administration to start this war. Donald Trump has unveiled his foreign policy program. It would radically change the attitude of America towards the world. The main themes are the rejection of interventionism and a “promotion of democracy” policy, realism and the protection of national interests of the United States as a national power and not a global hegemon, the output of the Trans-Pacific Partnership, and the suspension of the signing of the Trans- Atlantic Partnership and a goal to find a compromise with Russia on the basis of shared interests. Implementation of this program will mean a blow to the interests of the beneficiaries of the current hegemonic US policy. To avoid these changes, the Obama administration artificially intensifies conflict with Russia (as well as in the South China Sea with China) in order to make the transition to a policy of isolationism impossible in any case. Their task is to make a confrontation with Russia so sharp and irreversible that if Trump wins the election in November, he will be unable to change anything, and will become a hostage to the trend pledged under the previous administration. A properly configured public opinion, as well as elite factions of Democrats and Republicans in Congress controlled by globalists, will make any reset in relations between the US and Russia impossible, even in the event of a Trump victory. The new president will be forced to continue the previous policy. Thus, through a confrontation with Russia he will be biased by hegemonism and its conductors will remain in power. In the event of a victory for warmonger Hillary Clinton in the next presidential elections, the current policy of deterioration of relations with Russia will receive a logical continuation. Already pumped up with anti-Russian propaganda, society is prepared for the aggressive policies of Hillary. The very "Russian threat" as a factor in the media can contribute to the victory of the militant Clinton, not Trump. However, in the future, Hillary can either continue the confrontation with Russia, under the pressure of non-conservative lobby, or if Obama’s aggravation reaches a critical point, he will defiantly offer a "reset", but will ask for concessions. For example, Hillary may request that President Putin refuse to run for another presidential term. Finally, the radical and catastrophic scenario. 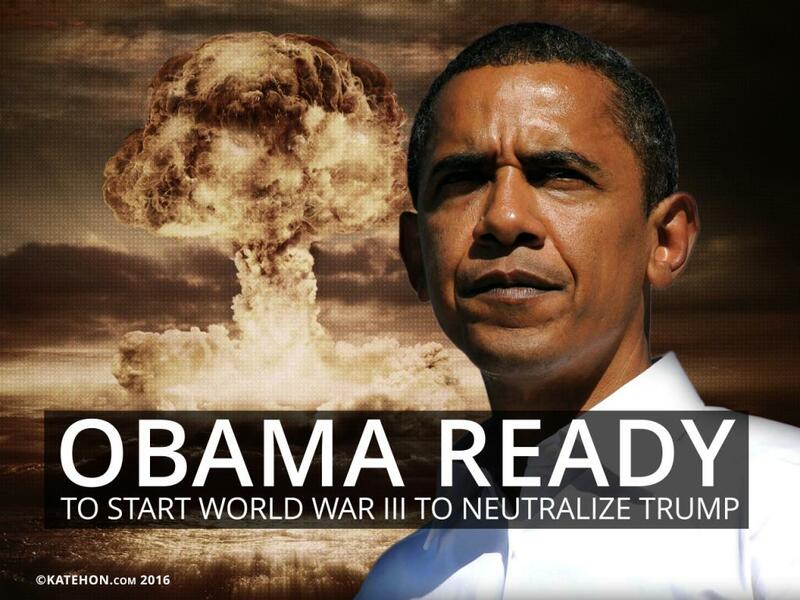 Obama can remain in the chair of the president in the event of a declaration of war. This is the least likely scenario, but given the fact that groups of influence behind Obama and Clinton are ready for any blood, if only to preserve their power, it cannot be discounted. In the case of this scenario, the factor of Trump will naturally disappear from internal American politics. The most likely scenario is the first, but in any case, for the entire world, all of them will mean new rivers of blood.